Academic Conference by the Department of Humanities and Social Sciences, IIT Madras. For decades on end, IIT Madras has placed great importance on holistic development. At the end of the degree, a student would not only know their chosen specializations but also would have picked up myriad skills along the way. The Department of Humanities and Social Sciences (DoHSS) is no different. With every edition of its Academic Conference, students are trained to not only kindle their brain cells but also put together a stellar event, thinking through all the details from water bottles to high-profile speakers independently. 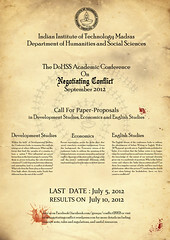 The Department of Humanities and Social Sciences is organising its second academic conference in the month of September, 2012 under the overarching theme of ‘Negotiating Conflict’. The two day conference will have a session each on Economics, English Studies and Development Studies offering an array of lectures, panel discussions by the leading thinkers and paper presentations by students. The previous edition of the conference saw the likes of Martha Nussbaum (philosopher and feminist), Ambai, David Dean Schulman and Robert Fogel (economic historian and Nobel Memorial Prize winner) delivering the keynote lectures. With global experiences giving economic explanations behind social crises, the Economic stream of the conference looks to address the relation between economic inequality and social conflict, the scope of the state policy and state’s institutional dilemmas. The English stream of the conference looks to address the definition of Indian writing in English in terms of emerging spaces, borders and boundaries. Creation of different identities, state’s role in initiating and curbing ethnic conflicts and the history and possibility of ethnic conflicts in South Asia form the theme for the Development Studies. Eligibility: Currently enrolled in an undergraduate/post-graduate program. UG students who have completed their course in 2011-12 academic year are also provisionally allowed to send the proposals. However, their participation in the Conference will be guaranteed only upon enrollment for a PG course in the 2012-13 academic year. Interested students can send their proposals (750-1000 words) to the email id: negotiatingconflict2012@gmail.com on or before 5 July 2012. Selected students will get two months to complete their papers. For more details on eligibility, themes please visit the Facebook group at www.facebook.com/groups/conflict2012 . This entry was posted in Uncategorized and tagged 2012, Department of Humanities and Social Sciences, Development Studies, Economics, English Studies, IIT Madras, July 5, Negotiating Conflict 2012. Bookmark the permalink. 1 Response to Academic Conference by the Department of Humanities and Social Sciences, IIT Madras. how to make a query???????? ?